Savvy Orange Juice Party Noise readers may recall that in 2008, I reviewed the latest album by the Cold War Kids, Loyalty To Loyalty. If you don’t remember, I will sum up the review: I did not like that release from these four boys from Fullerton, California. 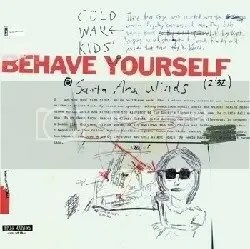 Fast forward a little over a year; I find myself with a copy of the Cold War Kids’ latest EP, Behave Yourself. I decide to give it a shot because it’s just a tad over 14 minutes in length; I might as well throw it on while I do some chores. I don’t know if my taste has changed since that last album review, or if they have just gotten a lot better, but I find this to be a decent release. Many of the same points I raised on that last review appear again on this one but in a different context; they are strengths instead of weaknesses. The sound on here is one of soulful, indie rock. It seems like Nathan Willett has gotten comfortable with the sound of his own singing voice and is no longer trying to ape Thom Yorke (he still sounds like the dude from Ghostland Observatory, but not in an annoying way). He injects emotion into his words and when he sings, “Lord, have mercy on me!” in “Sermons,” it sounds like he means it. While listening to this EP, I feel like the CWK have turned into a less-Southern, more soul-influenced version of the Kings of Leon. Surely that will be to their benefit as the Kings are currently on top of the music world, and the songs on this EP are better than the songs on the Kings’ last release, Only By The Night. It’s good to give bands second chances; they just might surprise you with how much they’ve grown into their sound. This entry was posted on January 31, 2010 at 12:00 pm and filed under TheSlacker. You can follow any responses to this entry through the RSS feed.